The horror genre has always been plagued with the incorrect notion that a horror film is the fastest, easiest way to get a film credit under your belt. This is why horror fans must slog through quite a bit of crap in an effort to find that one true piece of independent cinema that takes itself seriously, but not too seriously, and manages to succeed at tweaking the usual genre trappings. 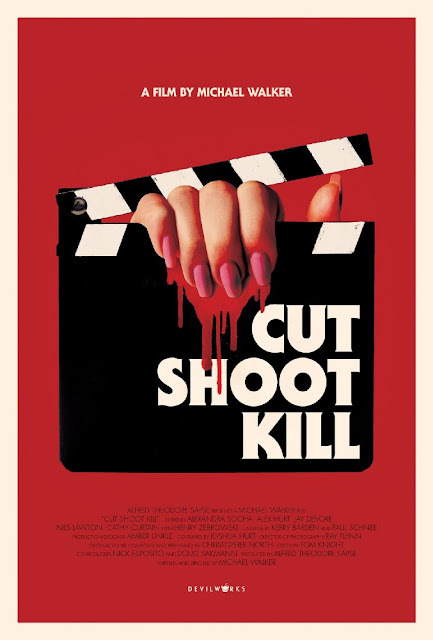 Ladies and gentlemen, it is my pleasure to introduce you to Michael Walker’s Cut Shoot Kill. Starring Alexandra Socha (Red Oaks) as Serena Brooks (complete with a Louise Brooks haircut): she’s a young, ambitious actress who doesn’t want her career to be a bunch of slasher films. She may have done her requisite Law & Order role, but she’s not about to sink to the level of becoming a Scream Queen. After losing yet another role to Shailene Woodley, her agent talks her into watching a short film from director Alabama Chapman before she writes off horror completely. Despite harboring negative preconceived notions, Serena meets with Alabama and he immediately loves her and wants her for his next film. After her agent strokes her ego just enough, she reluctantly agrees to taking the role. Alabama Chapman (Alex Hurt is a revelation) and his crew are a very tight knit group who have been making movies together for a while now and Serena is going to need to humble herself if she wants to get along with them for three weeks. Alabama’s previous Scream Queen, Nicole (Rebecca Faulkenberry), was the unfortunate victim of murder and that is why Alabama and crew need a new one. The nature of Nicole’s demise is suspicious and watching this particular mystery unfold presents a storyline that feels truly fresh. Serena finds herself surrounded by other actors who all inhabit specific stereotypes (the ditz, the serious actor, the classically trained actor) and none of them are truly ready to deal with the idea of working out in the middle of nowhere with no cell service. Yeah, yeah, yeah…there’s no cell service and Serena tells her boyfriend that she doesn’t want him to visit her on set. Everything is conveniently set up for all of them to be isolated with this group of backwoods stereotypes who, inexplicably, have quite the library of horror films to their credit. The tone for both the film and the crew is set when the makeup guys pull a practical joke that shows exactly what kind of survivor Serena is. From here on out, one is never, initially, certain if we are watching the movie or a scene from the movie within the movie. Cut in between all of this are scenes from Alabama and Nicole’s final film together. As reality and make-believe start overlapping far too much, the question becomes what is real? How far is Alabama willing to go in order to illicit raw emotions and reactions? The charm of Cut Shoot Kill is that it’s an independent horror film that truly understands, respects and loves the genre. It starts like any other film and the characters all feel very familiar and one note, but as the story begins to unfold, the complexities and secrets of everyone involved make for a much deeper experience. Hurt, in particular, impresses with his ability to make you uncomfortably sympathetic with him. 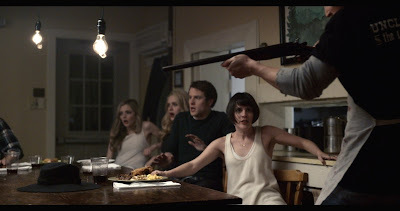 Cut Shoot Kill is a welcome surprise in a sea of been there, done that slasher films.